"The greatest medicine of all is to teach people how not to need it." 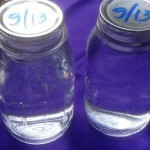 Posted September 7, 2013 by Heather Michet & filed under Crow Living, DIY, Drinking Water, Water. We’ve also heard that every household needs to store at least 1 gallon of water per person per day (to last 14 days) to use during natural disasters and emergencies. Purchasing this much water can get spendy, especially if there are several people in the household, and if you change it out every year, as suggested. The bigger issue, in my book, is that most “stored” water is in plastic bottles that leach carcinogenic chemicals into their contents. Adding to the health concern is the fact that the quality of the water being bottled is of unknown origin and there are no regulations in place to ensure quality standards. What’s the solution? Create your own bottled water! When you’re canning your harvest this fall or at any time of year, can filtered water for storage. This way you know the quality of the water and the (stable) glass jars will keep the water pure without adding the toxic contaminants that plastic bottles do. It’s so easy to do this, too. Whether you’re canning in a pressure canner or a hot water bath, you can always fill up the empty jar spaces with jars of water. This is great when you can a small batch of something and have leftover room in the pressure cooker. Using jars of water like this, also keeps the food-filled jars from toppling over into the empty spaces. Boil filtered water. Fill hot sterilized jars – pint or quart – with hot water, leaving 3/4 inch of headspace. Secure with prepared, sterilized caps and rings; tighten. Place in canner along with other food filled jars you are canning. Process all for the amount of time the canned food needs to run. Make sure the process time is at least 10 minutes. Date the food jars with labels or with a permanent marker on the lid. Congratulate yourself on a job well done! You’ve eliminated plastic bottles from winding up in the landfill, taken care of yourself and your family members, and have saved money in the process. And you can rest easy knowing you’ve got great quality water when you need it. Canned water, who would have ever known. These statements are provided for informational and educational purposes only and have been neither approved nor refuted by the Food and Drug Administration. Any advice and/or products mentioned should not be used to diagnose, treat, or prevent any illness. Consult your healthcare professional if you have a health condition, are pregnant, or are currently taking medication before using any products or applying any of this information. Iris Healing Arts, LLC and Heather Michet cannot be held responsible for the misuse of essential oils, products, or any of the therapeutic methods presented herein. DIY Toothpaste: Great for Simple is good. Homemade is better. Waste-free is supreme!